Plain cigarette packaging could lead to 300,000 fewer smokers in the UK over the next year, a major review suggests. Standardised packs could also reduce the appeal of tobacco and increase calls to quit helplines, experts behind the Cochrane Review said. UK law, which comes into full effect in May, states that all cigarette packs must feature health warnings and have a standard colour, shape and font. But a smokers' group said the estimates were "wishful thinking". The Cochrane Review team, led by researchers from London and Oxford, estimated that the number of people who smoked in the UK could go down by 0.5% by May 2018, although they said the current evidence was limited. The findings were backed up by a report from the Australian government, which showed a similar drop in smoking prevalence - 0.55% - following the introduction of plain packaging there in 2012. Currently, about 17% of the UK adult population are smokers. The review looked at new evidence from 51 studies, involving 800,000 people, on the impact of standardised packaging on smokers' attitudes and behaviour. It is also the first review to include research on smoking in Australia after packaging rules were changed. Prof Ann McNeill, lead review author from King's College London, said there was evidence that standardised packaging made people less likely to be motivated to smoke and reduced cravings for tobacco. The health warnings, which have to cover 65% of the front and back of packs, were prominently in people's eye lines, she said. But there was room for further changes to cigarette packs. "It would appear that the impact of standardised packaging may be affected by the detail of the regulations such as whether they ban descriptors, such as 'smooth' or 'gold' and control the shape of the tobacco pack," she said. However, there were no studies showing whether changing the packaging affected the number of young people taking up smoking. Giles Roca, director general of the Tobacco Manufacturers' Association said: "This report destroys the rationale for the introduction of plain packaging by finding no evidence that it actually acts a deterrent to young people in taking up smoking - this was at the core of the government's and health campaigners' argument for its introduction." Simon Clark, director of the smokers' group Forest, said the estimates were "wishful thinking, based on hope and anecdotal evidence, not facts". "Since plain packaging was introduced in Australia, smoking rates have fallen, but only in line with historical trends," he said. What is happening in other countries? Australia was the first country in the world to require cigarettes to be sold in plain, standardised packaging, in December 2012. The UK became the second country to pass similar legislation. Ireland and France have followed suit. 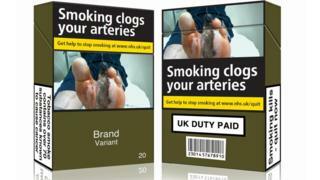 Several other countries, including Hungary, Slovenia and Norway, are now in the process of introducing plain packaging laws. Uruguay introduced large health warnings on cigarette packs in 2005.